True or false – pitchers don’t need more break on their pitches, they need their pitches to break later. You might know the answer, but do you know how to practice it? For years, pitchers have grown up hearing they’ve got to get more break on their pitches, that you can never have enough jump on a ball. And while lots of movement isn’t a bad thing, it is harmful for pitchers to only think about the amount of movement instead of considering when the movement happens. Most pitchers, in their obsessive quest to “get more break on the pitch” simply make the pitch break sooner – as in almost immediately out of their hand – causing the batter to easily determine where the pitch will, or won’t, end up. The less able a batter is at predicting where a pitch will end up, the less able they are to time it up and hit it squarely. This concept of not allowing the batter to predict where the pitch ends up is where “the tunnel” comes in. Because a swing takes time, the batter must start their swing before the pitch gets to the plate. Technically, the batter must start her swing when the ball is about 2/3 of the way to the plate in order to have enough time to execute her swing. As a result, where the ball is at this 2/3rd-of-the-way-to-home-plate-point either helps the batter better predict where it will be when it crosses the plate…or it won’t. As you can imagine, the more predictable the pitch-path is at this 2/3 point, the easier it will be for the batter to hit it. Our job as pitching coaches is to train our pitchers to have their pitches more AFTER they pass the decision zone (the 2/3rd’s point). As long as the pitch breaks after this point, it doesn’t have to break much for it to end up in a point other than where the batter created her swing to go. Make sense? Since our mind works in pictures, it’s hard to imagine this 2/3 point, so I call it “the tunnel”. 1 net is about 15 feet in front of homeplate, and it represents the Tunnel. 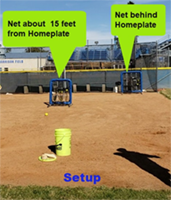 The 2nd net is just behind homeplate and it represents the catcher. 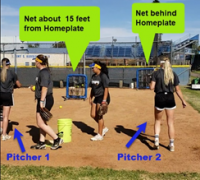 Have your pitchers start on the pitching rubber throwing to the closer net. They’ll throw their pitch (any type of pitch), hard, into the net. Then they’ll grab another ball and move over to the next rubber and throw that same pitch into the net at homeplate. The idea is to have focus more on where the pitch passes through the tunnel instead of simply trying to make the pitch a strike down at the plate. By the way, this tunnel concept is the reason you’ll see great hitters in softball and baseball swing at pitches in the dirt or out of the strike zone. When they had to start their swing, that same pitch was in a sweet spot for that hitter as it passed through the tunnel…it just ended at a different spot. If you’re wanting more terrific pitching instruction including drills, techniques and workouts – check out our Pitching Summit Vault!